Buddhist pilgrims at Śrī Mahabodhi, Anuradhapura, the oldest documented tree in the world. It was brought from India as a sprig from the tree under which the Buddha was enlightened, ca. 530 BCE. The rite known as nanu mura mangalle (Bathing ceremony) held in relation to sacred objects is performed at the bodhi tree as well. It is a. ritual that has been instituted from the earliest times. A Sinhalese king of the fifth century AD, Dhatusena, is shown continuing this custom. Today, however, this ritual is conducted not by maidens but by monks and laymen. Bodhi-pujas, offering of vows to the bodhi has become today extremely popular. 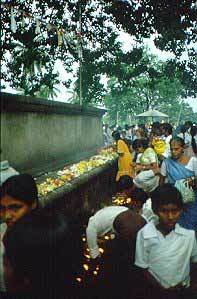 The bodhi tree which makes rains fall, crops grow and blesses women with offspring is, thus, tended with care and veneration by the Sri Lankan Buddhists.